Committed to a mental institution for her tales of a strange place called Wonderland, Alice receives an irresistible call back to the place she visited at a girl, but this time to save the man she loves: a genie, Cyrus, caught in a plot between the Red Queen and Jafar, the villain from Disney’s Aladdin. As we explore the ties that bind all of the characters together, we learn of what brought them all to Wonderland and how that shapes the events now. Along for the ride is the Knave of Hearts, Will Scarlet, a man with ties to the Queen and the White Rabbit. Of course, it wouldn’t be complete without some Once cameos, like Grumpy, Cinderella, and Robin Hood. This cast, much like Once Upon A Time, is relatively unknown to American audiences and it draws heavily on some overseas stars. Sophie Lowe stars as Alice, and she brings a fire last brought to the screen by Mia Wasikowska in Tim Burton’s take on Wonderland; she certainly knows how to handle a blade. Peter Gadiot brings an interesting twist to Cyrus, a genie burdened with centuries of transport and different masters. Lowe and Gadiot’s chemistry shines as brightly as Charming and Snow’s, and one will find themselves rooting for the pair the entire time. Michael Socha rounds out the “good guys” as Will Scarlet, and his evolution from Merry Man to “wanted thief” is effortless, and while a bit rough, I found his performance enchanting and endearing. Emma Rigby steps up to bat as a major player for the Villains, and does so quite gracefully as the Red Queen. The parallels to Regina are immediate and apparent, and I found my taste for her growing as time went on. Her malice, however, pales in comparison to Naveen Andrews’ as Jafar, and it’s worth sticking around to see just how far he’ll go to get what he wants. Not so much a villain, but not so much a hero, either, John Lithgow does a wonderful job as the voice of the White Rabbit. Like much of the Enchanted Forest, Wonderland is almost all computer animated, but the programmers and designers do a wonderful job of playing that up to highlight the more comical and fantastical aspects of the world, from the Boiling Sea to the Queen’s hedge maze. When it comes down to the actual sets, they blend seamlessly into the world around them. Of course, special effects abound, and it’s worth paying attention to the Cheshire Cat, if not for the pure character alone! While Once is stuck in Neverland for the time being, it’s worth giving Wonderland a shot. While it’s no Once Upon A time, the creators did a lovely job of giving us something to fill the week between Once episodes and keeping us drawn deeper and deeper into the rabbit hole. 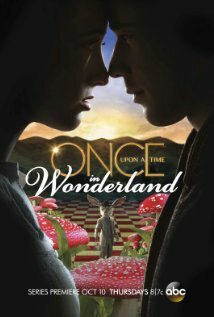 Catch Once Upon a Time in Wonderland Thursdays at 8/7c on ABC. You can watch episodes online on the show website. Chris Lovato is a twenty something Coloradan who happens to know how to wield a sword…and a pen. Although more inclined to the dark and macabre, his love is literary fiction (based in the ”real world” with a supernatural twist). You can find his blog at roboticscorpionvoodoo.tumblr.com Follow him on Twitter @ceeloroboto.